The clocking is ticking, our incredible adventure is slowly coming to an end. Many people we have met in our travels have asked what will come next. I thought Australia would be hard to beat, but this trip, even though tiring at times, has been remarkable. So what’s next hmm, Africa, Japan, Chile etc., etc.? I know as long as we have the means and opportunity we will travel somewhere and then likely end our trip in Vienna. Before I write about our fun in the mountains of Austria just wanted to mention that I put up two different posts last time on the same day. One was on Berlin (What To Make of Berlin) and the other on Ecuador/Galapagos (The Two Sides Of Traveling), apparently there was some confusion. 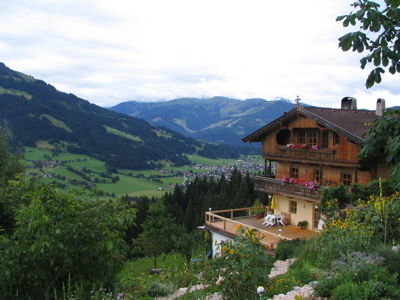 It always takes my breath away when we travel through the Austrian mountains. There is majesty, wisdom and beauty in these old Alps, our Canadian mountains still need to grow as they are youthful, rugged and defiant. 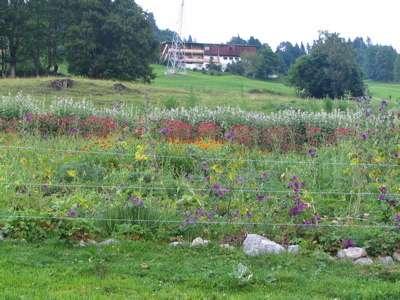 We were in Tirol, the heart of the European Alps. 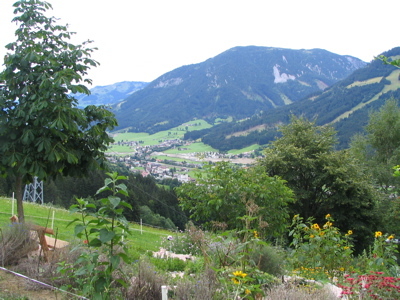 Tirol is Austria’s third largest province, most of the region is habitable but through conservation and land use laws around 20% of the region is protected. 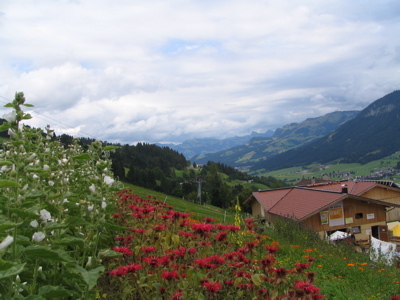 Another great thing about Tirol is that it borders onto Germany, Italy and Switzerland, and in no time you can travel to another country. 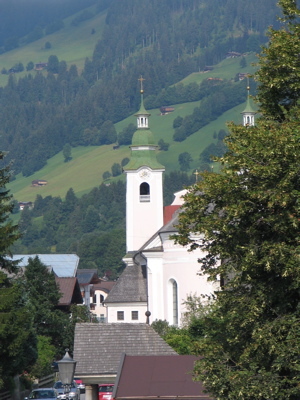 We stayed in the town of Brixen am Thale, which is among the Kitzbuhel Alps and all you ski fanatics should know the importance of Kitzbuhel (downhill racing). 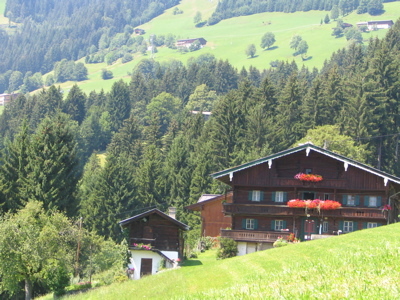 So now close your eyes for moment and imagine you are standing in the middle of a beautiful Austrian village in the mountains. Now open them and this is what you see all around you. 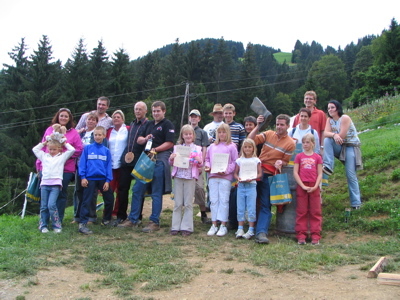 One of the reason we came to this particular town is that my cousin was organizing and running a game he created called Baurengolf which translates into “Farmers Golf”. No, it is not playing golf in a farmer’s field, no balls and golf clubs are required however you do need special footwear — rubber boots (but not for wearing). 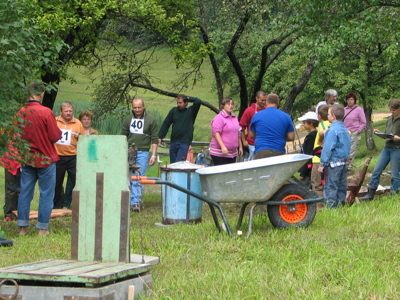 The Baurengolf course is set up by using containers and farm equipment (usually old) such as wheelbarrows, wagon wheels, butter churns, water troughs and many other types of farm implements. Around 14 stations are created with a certain task and point value. This is where the rubber boots come into action. 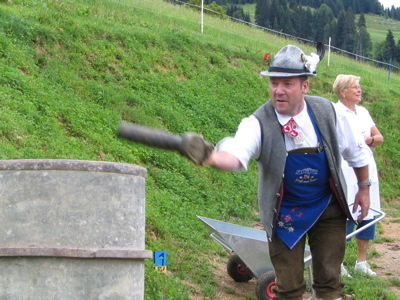 At each station you are have to throw the boot into a bucket or through a hoop, or bounce it off something and to ring a cow bell. 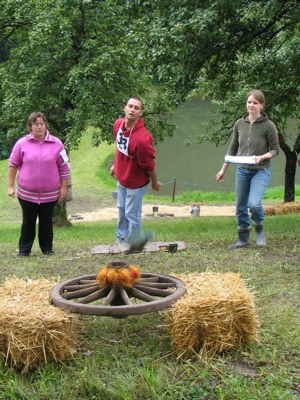 Another time you toss the boot from a distance to try and land on top of an old barrel and if it lands upright you get a bonus point. 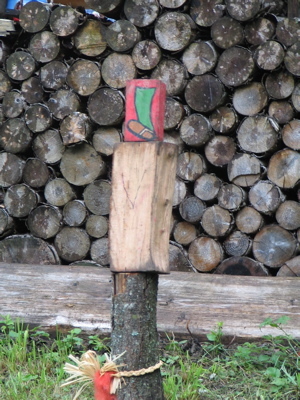 With another you throw a boot so it knocks over an upright log with a piece of wood on top extra point if it is just the piece of wood that falls. These are just a few of the stations but it should give you the general idea. 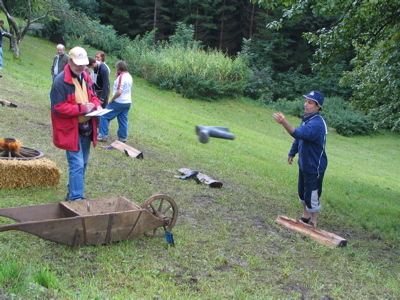 As well there is a separate contest of throwing a boot into a wheel barrel and seeing what is the furthest distant you can do it from…..7m, 9m, 11m, up to 17m. Your are allowed a total of 14 throws but must land one in the barrel by 7 tosses in order to continue on. Hey I managed to land one in from 11m to beat Steve. The following photos are from this year and last year as Steve and I were too busy play and working as referee/score counters, allowing little opportunity to take pictures of all the action. 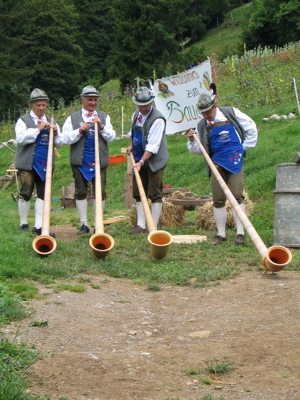 Theses guys you will see later on provided us with some wonderful music and they won the team competition. 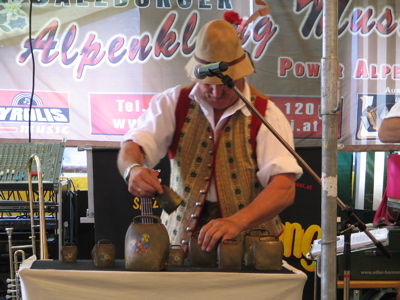 Our entertainment was provided by the Salzburg Alpenklang Musi with Maria. 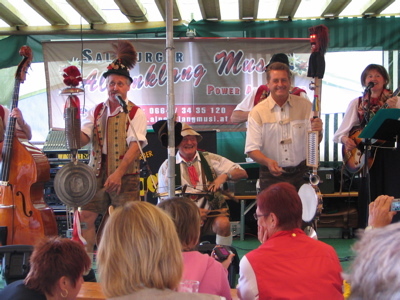 They very traditional Austrian folk music with lots of comedy in between. All I can say is PAPA , MAMA YOU WOULD HAVE LOVED IT!!!! 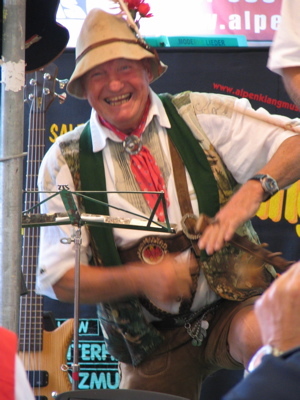 After hearing this guy yodel one soon realized that Walt Disney must have spent a fair bit of time in Austria and Germany. Just google Neuschwanstein which is a castle in Germany built for crazy King Lugwig you see immediately that the Disney castle is almost identical. If you have ever watched a Disney cartoon where Goofy is skiing and flying through either he lets out a howl that sounds exactly like what we heard here. So think it is safe to say in the early Disney cartoons there was some European influence. Like the big conches of the sea, the horns of the mountains entice you to follow the sound to behold the beauty of the Alps. 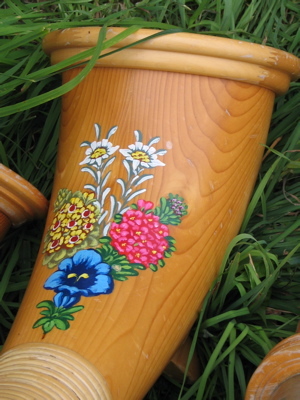 The sound from the horns seem to me to be championing the harmony of nature. 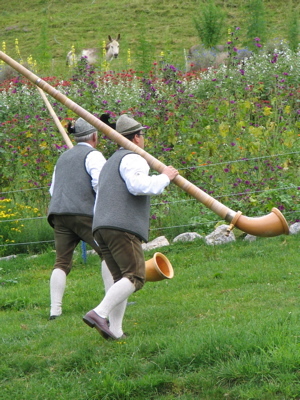 All the political leaders from around the world should be blowing these type of horns who knows what could happen then. 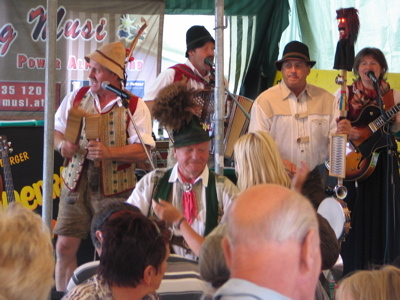 Now this wonderful entertainment was not here just for the Bauerngolf but for the Organic Herb Festival. 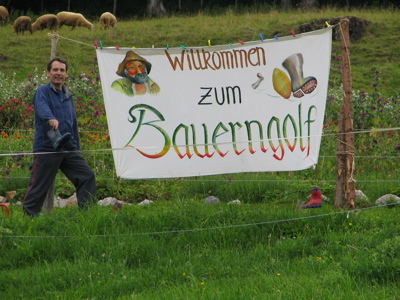 My cousin only sets of the Bauerngolf at events where there is organic farming. 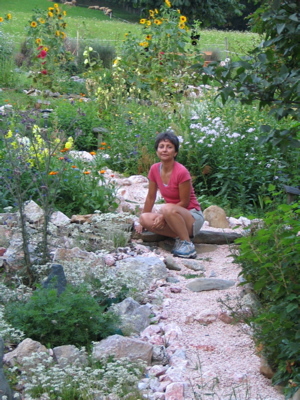 On this farm organic herbs were being grown and they had a show garden where you walk around and see all the different plants and herbs used in all their herbal products. The day was fantastic, who could complain being in the mountains with great food, drink and music, and with a little bit of fun on the side (Baurengolf). You can tell by these winners they had a great time (I’m poking my head through in the back). 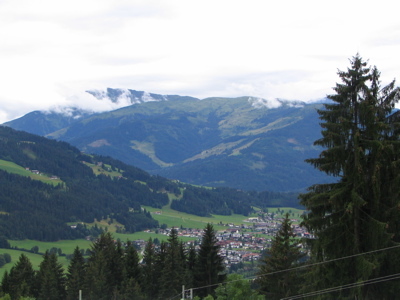 Just one last look at Brixen am Thale from way above (Steve had no altitude problems here). Renee: thanks so much for the game ideas for Maddy’s next b/d party 🙂 Looking forward to having you back.